1.1. kayâs mostoswak, paskwâwi-mostoswak, nânitaw mitâtaht tipahikan, êkoyikohk (Note 2) askiy nâma-kîkway nâkwan, ê-akoskahkik (Note 3) paskwawi-mostoswak. A long time ago, the buffalo would cover the earth for a distance of perhaps ten miles so that nothing was visible. 1.2. êwako âcimowin namôya kayâs mâskoc niyânano-mitanaw askiy (Note 4) êkospi ôma, iyikohk ê-mihcêticik mostoswak. This story is not from the long ago times, but it happened about fifty years ago, when there were many buffalo. 1.3 napêwak niyânan êwakoni ê-âcimocik ê-wâpamâcik, piko ê-pimôhtêcik ôki nêhiyawak. The five Cree men who saw this while on a walk, spoke of it. 1.4 akohpa ômisi ê-wêpinahkik, ê-tâwatisahiwâcik mostoswa (Note 5), êkwa ôtê nâway kâw (note 6) omisi ê-pê-kipwayayit, ê-misi-tâwayâyit. They shook the blankets in such a fashion (Note 7), to drive the buffalo to an open space and here to the back (Note 8), and they came to be enclosed in the large space (Note 9). 1.5 êkwa mitâtaht tipahikan êkoyikohk isko ê-ayâcik paskwâwi-mostoswak, iyokohk ê-mihcêticik, êka tawâyik ita kâ-pimôhtêcik. And for ten miles as far as the buffalo were in great numbers, there was no open space where they walked. To a distance of ten miles, the Plains Cree of old saw the stretch of the buffalo, some fifty years ago. 1.7. êyako (Note 11) pêyak âcimowin. kahkiyaw êkosi. This is one story. that is the extent of it. 2.1 pêyak napêw pawâmêkan (Note 12) isiyihkâsow êwako kâ-wâpamat ôhi mostoswak. One man was called pawâmêkan who had seen this buffalo. 2.2 êkwa pêyak napêw tampêsin (Note 15) isiyihkâsow. êkwa kôtak wataniy isiyihkâsow. Note 1: Does anyone know who the modern day descendants of kâ-kîsikâw-pîhtokêw are? What family names on Sweetgrass are his descendants? Note 4: I have always found the word “askiy” as a translation for “year” interesting. Does anyone know the history of this use? Was there ever another word for year? Also, can someone tell me how to say “year” in Anishinaabemowin? Note 6: I am trying to figure out the “kâw” here — trying to figure out what it has been shortened from. Note 7: Presumably Bloomfield forgot to record the gesture. Note 8: Presumably the narrator motioned behind him. Note 9: Referring to the buffalo pound, presumably. Note 10: Seems to be a more classical way of saying “iskwâyikohk” as my late father would say. Note 14: In these texts, kayâs seems to be used throughout to indirectly refer to the period before the reserve period. This is an interesting temporally disjunctive way of framing things. 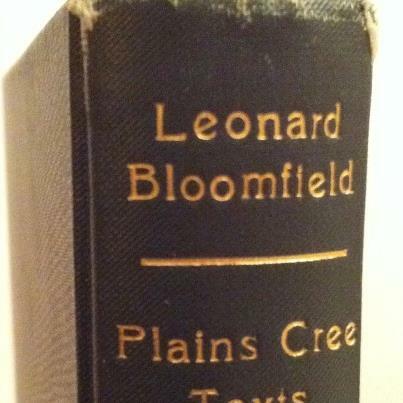 Note 15: Bloomfield thinks that this might be the same tawipîsin mentioned in another story. One thing to consider is that the /mp/ cluster would be unusual in the middle of a word unless it had been compressed. Does anyone understand the meaning of tawipîsi which would be the stem of the name? Note 16: These names are a form of oral history footnotes. They connect the narrator and audience to the original experience, and provide a sense of narrative authority.